Free two gram gold coin on purchase of diamonds jewellery worth AED 5000. Free one gram gold coin on diamond purchase of AED 3000. Pay 10% & get gold rate protection on jewellery until 5th November, 2018. Dubai, UAE, October 16, 2018: Malabar Gold & Diamonds, one among the largest jewellery retailers globally with a strong retail network of 250 retail outlets spread across ten countries unfolded the details of its much awaited Diwali promotion. 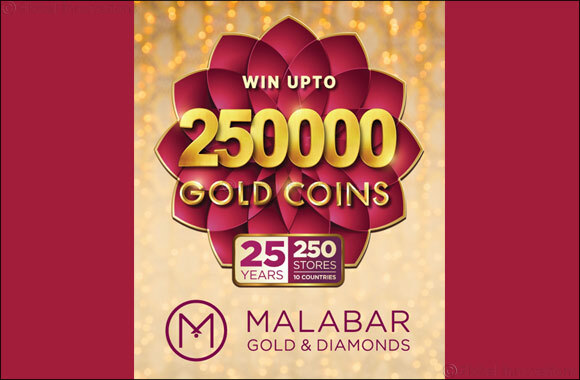 Malabar Gold & Diamonds is also celebrating its 25th anniversary during this festive season. The company is taking this opportunity to thank their customers for their continued support over the years. This season’s festive promotions brings every customer a chance to be a winner through this festival. The customers get unmatched chances to win a total of 250,000 gold coins across their showrooms globally. Customers can win a guaranteed gold coin or up to 100 gold coins instantly on purchase of gold jewellery worth AED 2500 via ‘Scratch & Win’ coupons. Adding to the above, customers also get two gram gold coin on diamond jewellery purchase of AED 5000 and a one gram gold coin on purchase of diamond jewellery worth AED 3000. Above offers are valid at their outlets in UAE until 10th Nov 2018. Also, customers will have a great opportunity to get protected from the increasing gold rate by just paying 10% of the entire amount on the selected gold jewellery. This offer is valid until 5th Nov only. To add more glitter to this season, they have also revealed their festive collection of jewellery in gold, diamonds and precious gems to suit the tastes of their multicultural and multinational customers. Malabar Gold & Diamonds has incorporated these designs as a part of various brands presented at Malabar Gold & Diamonds’ namely Ethnix - Handcrafted Designer Jewellery, Era - Uncut Diamond Jewellery, Mine - Diamonds Unlimited, Divine- Indian Heritage Jewellery, Precia - Gem Jewellery and Starlet – Kids jewellery. Malabar Gold & Diamonds is displaying an eye catchy collection of trendy designs in 18 & 22K gold, diamonds, platinum and precious gems from different parts of the world to flaunt at any occasion or event.